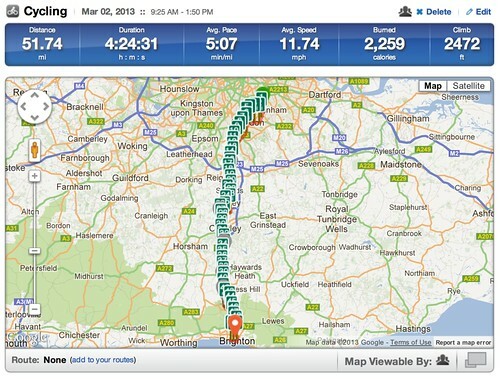 Today I cycled from my home in southeast London to Brighton aiming to break the 50-mile barrier. When I arrived in Brighton, I’d got to 49.3 miles so I rode up and down the coast ending by Coffee Republic for a well-deserved espresso. I stopped briefly for water and cashew nuts to keep me going. The last 15 miles were the hard ones. Between the 15th and 8th mile, I nearly gave up. The incline was getting to me, but then I got into the main Brighton area and managed to finish. Also throughout the ride, my toes where very cold and so were my hands despite wearing gloves. I’m not worried about my bike ride over four days between London and Paris. (This is in April – see previous posts and my JustGiving page.) Provided I do not get injured and I keep up my exercise bike training in addition to real rides, I should be able to do the ride. Furthermore, I’m not worried about missing the ferry to France. We are leaving at 630 in the morning and are having 2 refreshment breaks and lunch. The 70 miles is achievable provided I do not lose the energy. I did the ride on a Slow-Carb meal of steak, two eggs, broccoli (two portions) and black beans. I was absolutely fine until the last 15 miles when it took a little while for two handfuls of cashews (approx. 200 calories) to help. I do ride well when I have carbs, but it is possible to have a low-carb diet and do a ride like this. Padded gloves are definitely helping my hands. Without gloves or with normal gloves, my fourth and fifth fingers were going numb for up to two days after a long ride. I took the train back to East Croydon and cycled home from there. I should not have cycled as my calves are very tight as a result. I need to warm down properly and I’m considering taking a foam roll on the trip. Posted in Charity, Diet, FitnessBookmark the permalink.